Job interviewing is tough! Last week’s post on the importance of portraying an image of confidence when interviewing inspired a friend of mine in his 20s to give me a call for some advice. I’m sharing our conversation here with the hopes that his real life scenario can help you. 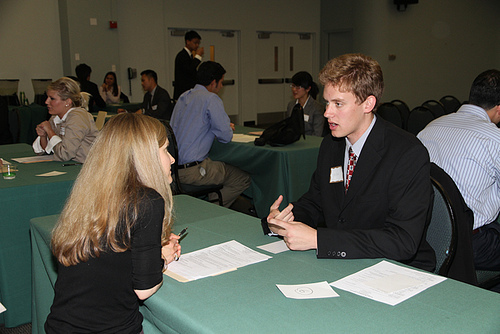 After all, interviewing is one of the 15 career development topics that will follow you through life. Jeff (that’s what we’ll call him) wanted to chat with me before his second job interview at a major entertainment company today. He told me that he fears he comes across as too laid back…and that the more nervous he gets, the more laid back he appears. He knows that appearing too laid back can look like the opposite of confidence! Jeff was concerned that not only will he not come across as confident at his interview but that he doesn’t really know who his competition is or exactly what the boss is looking for in a candidate. I suggested we step back for a second and talk about the opportunity he’s interviewing for. I asked him if it fits with his goals and interests. It does. I asked if it’s something he’s passionate about. It is. In fact, the subject matter of the job has been an obsession of his since he was a kid. I asked if he thinks he’s qualified to handle the position. Absolutely, he told me. I asked if he’s done his homework on the company and can speak intelligently about their products and their mission. Definitely. I asked if there’s room for growth at this company. Yes. He knows someone in this department who has moved up multiple times in just the past couple of years. I asked if he knows anything about the person he’s replacing. He said he knows she’s not one to hustle and go the extra mile. I asked if he’s the type who would go the extra mile. Absolutely – he’s used to working hard and staying late. In fact, he runs his own entrepreneurial web venture in his spare time, so he’s used to always being on the go. Plus he submitted an unassigned Powerpoint presentation to the company after his first interview to show his creativity and that he is always willing to go the extra mile. So I said WAIT A MINUTE! What’s the problem here, Jeff? You just expressed to me with confidence that you’re the right fit for this job. Now all you have to do is make the hiring boss know it too. That’s your MISSION for the meeting. Don’t walk in there feeling intimidated. Since you know you’re right for the position, what’s there to be intimidated about? Who cares if you don’t know who the competition is or exactly what the boss is looking for?! You know they wanted you back after your first interview! You know that what you bring to the table is the right fit for this opportunity and this department! You’ve already told ME why you’re the right person for this. Now, because you know that the boss has his choice of candidates, you have to prove to him at the interview why YOU are the person he should choose! Picture a lawyer making his or her case in the courtroom: “without a doubt A and here’s how and why; without a doubt B and here’s how and why; without a doubt C and here’s how and why; therefore without a doubt my client must be the winner”. Even if that lawyer believes everything he or she is saying to be true, to hit the necessary home run, you’d better believe that lawyer is putting on a performance in that courtroom and spinning his or her case in favor of the client wherever possible. You must do the same for yourself. Walk in to his office like you’re meeting with a family friend. I say a family friend rather than your friend because if you think it’s your friend you might belch and drop some Doritos on the floor without caring. Engage the boss in conversation the same way you’re engaging me. Be yourself – be fun – be the best you that you can be. Ask him questions about what he’s looking for as the ideal fit for his team. That way you can specifically address each of his concerns so that he knows YOU are the choice he needs to make. SELL YOURSELF on every point. This is your personal branding opportunity. Let him know about your geeky passion for this subject matter, about how hard you work, about how focused you are, about your website, about the volunteer work you do, about how you have experience working in a similarly fast-paced environment, about how your skill set of being creative and detail-oriented is thriving when put to the test by your current position, and most importantly how all of these things will make YOU make HIS team thrive so that HE succeeds and HE looks good to HIS BOSS. After all, you want him to get his $1 million bonus so that he can kick down a Starbucks gift card to you. You’ve already told me you want it, you’re passionate about it, you can do it and you can go the extra mile to succeed at it. What boss doesn’t want to hear all that?!?! Look at this interview as your OPPORTUNITY to prove that list of things to this boss. Discuss the unassigned Powerpoint presentation you delivered to his company. Tell him at the end of the meeting how serious you are about wanting this position and that you would be happy to do another project like the Powerpoint to go the extra mile and prove it to him. If you’re focused on your mission and you look at this as your opportunity to prove why you know you’re the right fit AND you look at the boss interviewing you as the family friend, you won’t have the time or space in your brain to get nervous or intimidated, appear too laid back or look like you lack confidence. In fact, this approach will force the aura of confidence. Jeff sounded energized and confident at the end of the call. In fact, he just called to tell me how great the interview went and how much our talk helped. I hope he gets the job! Do any of you have related stories or pointers to share?